From contract-tablets found at Tel-Ibrahim by the late Hormuzd Hassam, on which the ancient name of the place is given as Gudua or Kutu, it would seem that that is the site which has to be identified with the Biblical Cuthah. 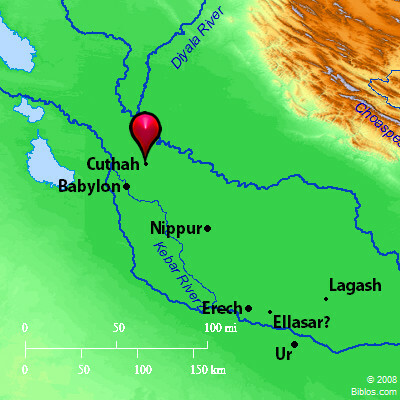 It lies to the Northeast of Babylon, and was one of the most important cities of the Babylonian empire. The explorer describes the ruins as being about 3,000 ft. in circumference and 280 ft. high, and adjoining them on the West lies a smaller mound, crowned with a sanctuary dedicated to Ibrahim (Abraham). From the nature of the ruins, Rassam came to the conclusion that the city was much more densely populated after the fall of Babylon than in earlier times. A portion of the ruins were in a very perfect state, and suggested an unfinished building. The great temple of the city was called E-mes-lam, and was dedicated to Nergal (compare 2 Kings 17:30), one of whose names was Meslam-ta-ea. Both city and temple would seem to have been old Sumerian foundations, as the name Gudua and its later Sere form, Kutu, imply. See Rassam, Asshur and the Land of Nimrod, 396, 409, and, for details of the worship of Nergal, PSBA, December, 1906, 203-18.